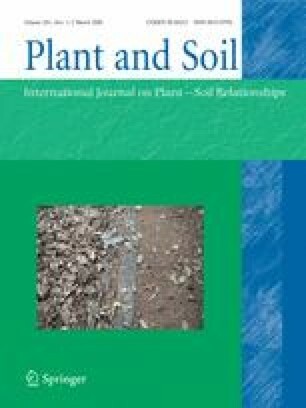 This study investigates the distribution of carboxylates and acid phosphatases as well as the depletion of different phosphorus (P) fractions in the rhizosphere of three legume crop species and a cereal, grown in a soil with two different levels of residual P. White lupin (Lupinus albus L.), field pea (Pisum sativum L.), faba bean (Vicia faba L.) and spring wheat (Triticum aestivum L.) were grown in small sand-filled PVC tubes to create a dense root mat against a 38-μm mesh nylon cloth at the bottom, where it was in contact with the soil of interest contained in another tube. The soil had either not been fertilised (P0) or fertilised with 15 (P15) kg P ha−1 in previous years. The mesh size did not allow roots to grow into the soil, but penetration of root hairs and diffusion of nutrients and root exudates was possible, and a rhizosphere was established. At harvest, thin (1 mm) slices of this rhizosphere soil were cut, down to a 10-mm distance from the mesh surface. The rhizosphere of white lupin, particularly in the P0 treatment, contained citrate, mostly in the first 3 mm, with concentrations decreasing with distance from the root. Acid phosphatase activity was enhanced in the rhizosphere of all species, as compared with bulk soil, up to a distance of 4 mm. Phosphatase activity was highest in the rhizosphere of white lupin, followed by faba bean, field pea and wheat. Both citrate concentrations and phosphatase activities were higher in P0 compared with P15. The depletion of both inorganic (Pi) and organic (Po) phosphorus fractions was greatest at the root surface, and decreased gradually with distance from the root. The soil P fractions that were most depleted as a result of root activity were the bicarbonate-extractable (0.5 M) and sodium hydroxide-extractable (0.1 M) pools, irrespective of plant species. This study suggests that differences among the studied species in use of different P pools and in the width of the rhizosphere are relatively small.